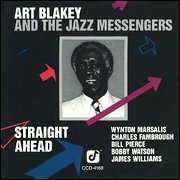 James Williams, piano; Charles Fambrough, bass; Art Blakey, drums. Anyone who is even casually familiar with the music of Art Blakey should have no doubt that this man views music (indeed, life) as a continuum. He credits Dizzy, Monk, Bird, Bud Powell, Coleman Hawkins and Don Byas with discovering and passing on, to Art and his contemporaries, the essence of bop. Art, of course, proceeded to pass around a goodly share of that knowledge as well, as he and the Messengers did one evening in 1981 at the Keystone Korner in San Francisco. For all its continuity, this particular event had a certain uniqueness. For one thing, The Jazz Messengers had a new musical director, a young man of great promise, responsible for rehearsing the band, programming the sets, contributing arrangements, and sculpting a cohesive ensemble sound. The success of Wynton Marsalis on all these counts is clearly documented herein. Listen to "E.T.A." His preparations were thorough, so much so that engineer and producer knew the sequence and duration of selections as well as the order of solos, quite a rare situation with a live jazz recording. Wynton was ubiquitous: on stage for sound check, conferring in the recording truck, checking the house sound, ("Watch the EQ. Right! That's how an alto sounds"). Serious coordination. We had high expectations. They were exceeded, and much of that was Wynton's doing. Soon he would be doing some other remarkable things, like becoming the first person in history to win Grammy's for both jazz and classical performance in the same year. Bill Pierce and Bobby Watson, like other Messengers before them (Freddie Hubbard, Keith Jarrett and Wayne Shorter come to mind), would shortly be leading their own fine bands, developing new ways to "pass around" timeless musical truths. The extraordinary James Williams, with several solo albums to his credit at the time of this recording, and Charles Fambrough with his mighty tone and solid time, were already being recognized by musicians, audiences and critics as world class artists. Live recordings are time bandits. They can hold a moment forever. None of us knows the future, but on that evening in 1981, we all realized something remarkable had occurred. Play this CD. Stand at a point, on a continuum. --FRANK DORRITIE, from the liner notes.